Everyone has a different dream: some want to walk on the moon, some want to be rich, some want to date several young chicks and some have other expectations. In the road-running world, one common dream is to run the Boston Marathon, the world’s oldest annual marathon and ranks as one of the world’s best-known road racing events. This dream can become true if you meet certain requirements. The major one is to qualify and for that, you need to run a qualifying race under a certain amount of time. The Erie marathon is one qualifying race and, as the course is very easy and flat, it is very popular for the runners that want to qualify to run Boston. As a consequence, every year, the Erie Marathon is like the power ball and many want to give a chance! This race is the Boston Qualifier (BQ) party, the fair where many hope they will do great and be able to access to the runner sanctuary. For the few that complete the race without issue, they can apply to run the race (but, considering the number of runners that qualify, there are no guarantee). For the others, this is “same player, try again” at a next qualifying race. Having no interest to qualify for Boston, I made the half-marathon so that I can have time to cheer on people that want to do it and also take an easy day and let my body rest. In addition, having already done a race the day before, a half-marathon was enough. The main reason I came back is that I ran it last year (first marathon, yay!) and had an horrible experience: being injured, I raced it while I was wrapped as a mummy to prevent more damage (which was obviously a miserable failure because I was not able to run for several weeks). One reason to come back is to have a better experience and have this sensation of a wonderful morning race surrounded by people I appreciate. 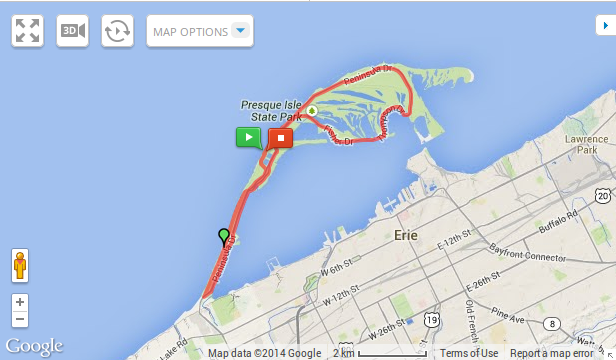 In addition, besides being a popular Boston Qualifier, the Erie marathon is a fantastic course, especially the half! If you are interested to run it, you might be interested by the following information. Otherwise, close your browser and come back to work. I arrived after having finished Rock’n The Knob in the Saturday morning. We booked a room at the Comfort Inn Presque Isle, located about three miles from the start. That was definitively a great idea: they propose a late checkout on Sunday (2pm, more than enough time to take a shower, pack and potentially have a post-race nap) and an early breakfast (0500am) for runners. Needless to say, a great service, nothing to compare to the experience we got during the Grand Canyon Marathon. In addition, the staff was efficient and helpful. A great place to recommend if you plan to run this race! 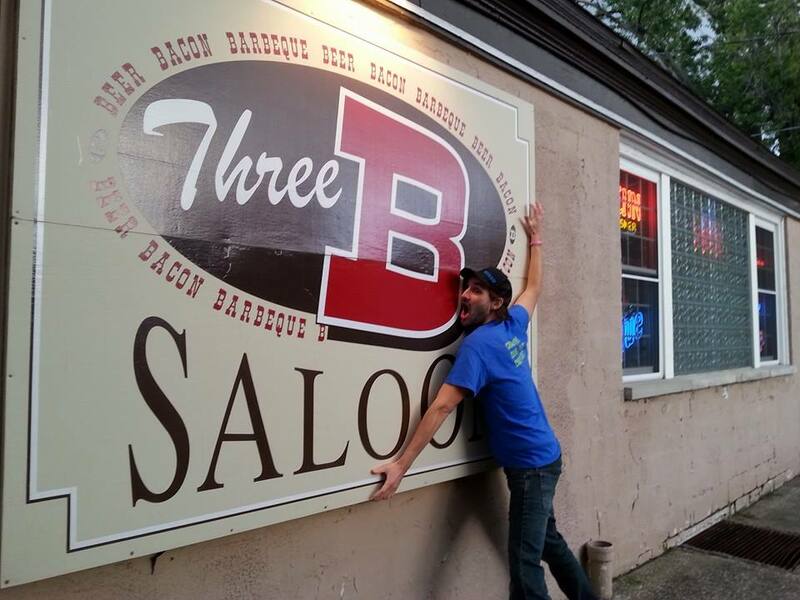 Before getting a well deserved rest, we visited a nice barbecue place, Three B Saloon. As all runners used to eat pasta and reduce alcohol or fat, I opted for the pulled pork, corn bread and of course, a big pumpkin beer. At that stage, after such a dinner, you cannot move anymore, so, you take a mandatory night of sleep. The packet pickup is located at the Presque Isle State Park. You can take your packet the day before or even on race day (in case you do not want to book a room). The expo is not very fancy: there are some vendors here and there with some interesting discount but nothing big. If you are looking for new gear, that might be a good opportunity. Other than that, there is nothing to do, except to go on the beach in case of nice weather. The beach is relaxing and beautiful. In case you are not a big fan of barbecue (well, nobody is perfect and has good taste! ), there is a pasta party that is organized by volunteers. As I wanted to fuel on healthy pulled pork with beer, I careful avoid any recommended nutrition such as pasta. Load the fat, baby! The bag contains a tee-shirt, your bib, your timing chip and some documentation about the race. Again, nothing really fancy and more than enough! The race starts at 700am for the marathoners that are hoping to qualify for Boston (or not) and 730am for the happy fews that want to do the half. Parking is available next to the starting line and you just have to walk half a mile to get to the race. The course is the same for the half and the full marathon. The main difference? You have to do two loops if you are doing the full. So, save your legs: do only one loop! The race is scenic, you go all around Presque Isle, see the sun shining, the nature waking up, the lake and the beach. If the weather is collaborative, you cannot have a better experience with a low temperature that increases over time. You can see the course below as well as the elevation: this is very flat and you will not have any hill at all. After running several trail events last weeks (Rock’n the Knob the day before and Groundhog Fall 50K one week ago), it seemed very unusual and easy on the legs. There is a drop bag service so that you can pack a jacket to use when you are done. This can be useful in case you are running the half and stay to wait for a friend that is running the full (avoid to freeze while waiting). The course is packed with water station at every mile so that you can do the race without any hydration pack or bottle. Some gels are also provided during the race. Also, at the finish, bagels, chocolate milk, sandwiches and cookies are provided to the runners. Great way to refuel after your run! As every year, many (most?) runners come with expectations in mind. Being very flat, everyone want to take something out of this race: either a record with a great time, a qualification for Boston or just completing their first big road race. And as everything in life, sometimes you win, sometimes you lose. Some learn it the hard way and finish the race very disappointed. Others meet their objective and are happy, until the next race that might wash this achievement. This focus on performance can be overwhelming and divert us from one of the main reasons so many people join the party: come and have fun together! My goal was to have a great week-end with my partner in crime and rest after long weeks. Objective accomplished, I cannot be more happy and I had a great time running Rock’n the Knob on Saturday and this half-marathon at Erie on Sunday. 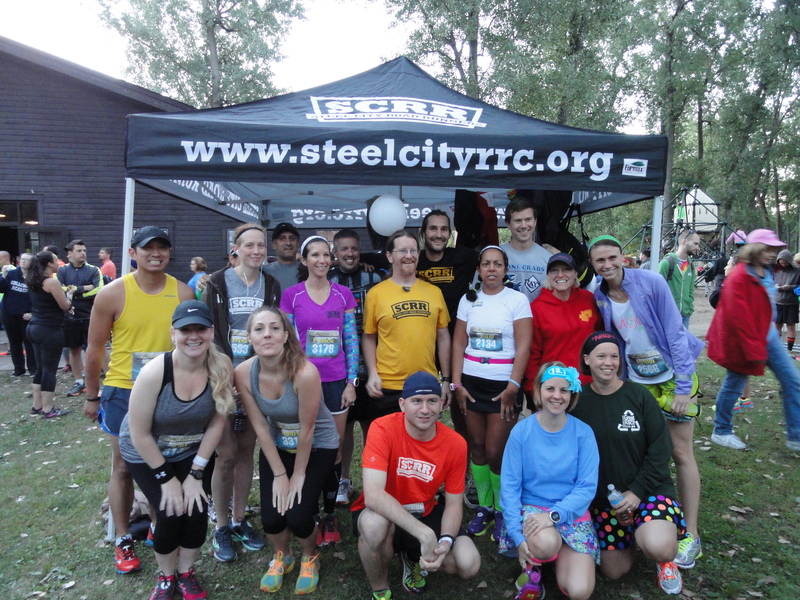 Cheering all runners from SCRR was very fun and seeing everybody having fun running at Presque Isle was a great way to connect with my local running community. If I had a great time at both events, this week-end shows how much I love the trails and I want to focus on this type of event. The trails offers a scenic views and invite you to discover what nature has to offer. There is a sense of freedom and a connection with nature I do not get in any other event. Also, the competitive nature of road races does not appeal me that much and my goal is rather to connect with a the trail community and discover the surroundings. That is why I will plan more long distance races (probably a few 50K and some 50 milers) in the coming months and keep only few short road races mainly to cheer my friends and share good times.